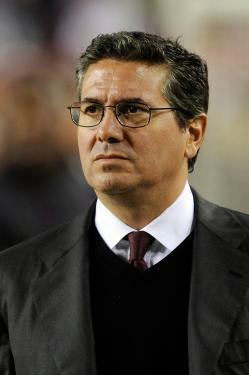 Dan Snyder, Redskins: A season of miracles in Washington—the team reappears, and the owner vanishes. The Redskins reappear, and the owner vanishes. Washington Redskins owner Daniel Snyder looks on before a game between the New York Giants and Washington Redskins at FedExField on December 3, 2012 in Landover, Maryland. Photo by Patrick McDermott/Getty Images. Dan Snyder didn’t even show up to his team’s annual turkey giveaway before Thanksgiving. Somebody clearly told Snyder, the Redskins’ unbeloved owner, that he couldn’t win until his team won. And dang if he didn’t listen. And dang if the team didn’t win. Snyder’s media strategy this year—stay invisible—has been followed with discipline and worked brilliantly. Since he bought the franchise in 1999, presenting himself as a boy-fan who grew up to live the dream of owning the team, Snyder has been the face of the Redskins. He’s never been cooperative with real reporters, but went through just enough staged Q&A’s at charitable events or with either high-level employees or little kids guesting on TV shows he produces to remain in the public eye. Until this year. But this year, Snyder was quiet. He didn’t get in the way of the rare sympathetic press that came his way in the offseason after the team was hit with a salary cap penalty, which was really just a voiding of the cap benefits the team thought it could get by paying off the old-school bloat in Albert Haynesworth’s and DeAngelo Hall’s contracts during 2011’s labor strife. Commissioner Roger Goodell and New York Giants president John Mara, the folks behind the cap hit, were the Bad Cops in everybody’s eyes. Snyder helped his own cause away from the team, too. Snyder got through 2012 without any of the sort of punchline-worthy behavior he’s always shown in the past with his non-Redskins diversions. He didn’t buy a $70 million yacht all year. Because this season, Snyder’s had nothing going on but the Skins. For the first time, Snyder’s organization is the talk of the nation—for all the right reasons! Robert Griffin III has picked up a foundering franchise more singlehandedly than anybody since Roy Hobbs. The season-ending streak that took the Redskins from thinking about next year to playoff contention, capped off by a boffo performance by a blatantly wounded Griffin—tell me that wasn’t the most dominant 100-yard passing performance an NFL quarterback has ever registered!—in the team’s first loser-goes-home game since 1979, was straight out of The Natural (the movie, that is, since in the book Hobbs failed in crunch time, meaning he’s a lot like Tony Romo). All because of a quarterback who didn’t fall into fans’ laps so much as the organization threw him there. Whatever, the guy’s given any Redskins follower a season long lap-dance. So anybody who blamed Snyder for all the crazy deals gone wrong through the years has to give him credit for a crazy deal gone oh-so-right: Three first-round picks and a second-rounder for one draft pick? Unheard of! And, far as we now know: Brilliant! My father in law gave me a Redskins hoodie for Christmas. Burgundy and gold garb worn anywhere and any time, even inside the Beltway in the fall, had become about as ridicule friendly as white shoes after Labor Day. I’ve got lots of old licensed gear in closets and drawers, but haven’t put it on much in recent years. But times have changed. I’m wearing my new hoodie as I type this.